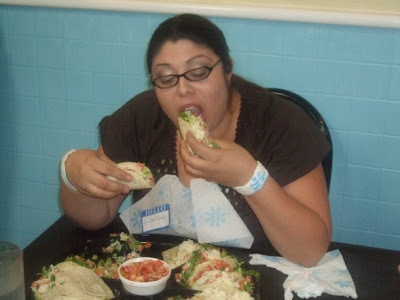 Frequent blog reader Daniel just sent in this news item from Slashfood stating that a steady diet of Mexican food may help to prevent the occurrence of breast cancer. If that's true then that's good news for everyone, except for maybe non-Mexican restaurants. Where's my pink ribbon icon when I need it? BTW, a new restaurant review is coming soon. No, it's not a disco inferno, it's new Del Inferno, Del Taco's new hot sauce which is apparently three times hotter than Del Scorcho. Read all about it at The Orange County Register's Fast Food Maven blog. The part you'll really want to pay attention to there is the second comment, which was left by Del Taco's PR, explaining that Del Taco will have a Del Inferno fire truck going around the LA/OC area with samples of the hot sauce for people to try. Hopefully there'll be tacos and burritos to try them on. 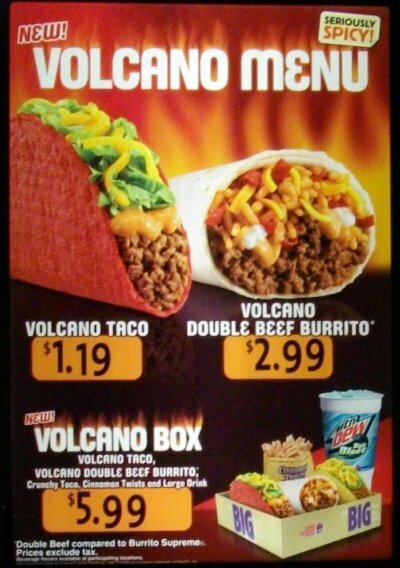 (LAKE FOREST, CA) April 28, 2008 – Del Taco fans who love to intensify their favorite food experience with a blast of hot sauce will have yet another fiery option available beginning April 28, when Del Inferno makes its debut. 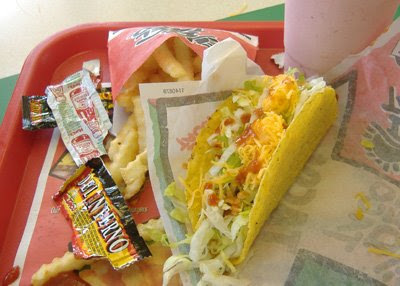 According to Mimi Somerman, chief marketing officer at Del Taco: "A little Del Inferno goes a long way and we're certainly meeting the needs of our spice-loving customers looking for a bigger, bold taste." 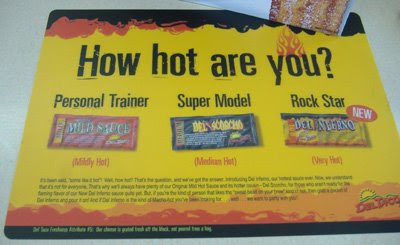 "We want to share this big bold flavor with those who face real heat every day," added Somerman. Del Taco now offers four different kinds of packaged sauces—mild, Del Scorcho and Del Inferno. The fourth? Ketchup, of course! 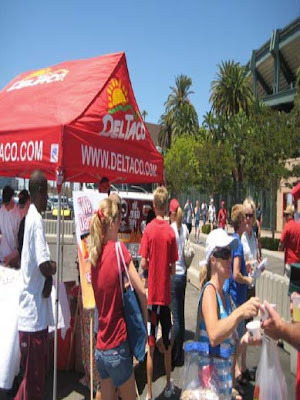 To introduce the new sauce to southern California, Del Taco's decked-out Del Inferno fire truck will be making sampling stops at beaches, fire stations, skate parks and concert venues beginning May 10 with the Fire Service Recognition Day in Los Angeles. *To request Del Inferno hot sauce, firefighters are encouraged to email publicrelations@deltaco.com and include their station contact and mailing information. I'll be giving Del Inferno a try when I get a chance but I'll be sure to have one of their strawberry shakes on hand when I do. And people are already talking about Del Inferno on Yelp. NEWER UPDATE: Was actually able to try Del Inferno later on in the day during a quick stop on the way to Disneyland. I tried it on a crunchy taco and also mixed a little bit into the ketchup for my fries. And, yes, I had a strawberry shake on hand. Yes, Del Inferno is definitely hot but fortunately it didn't kill me or cause any sort of stomach upset. And it made my taco taste better. 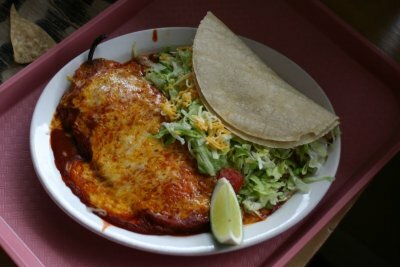 The Newport Beach Film Festival is beginning today and there's actually a movie on the schedule about Mexican food. The film entitled Eating Levi is, "The story of Levi Oliver, the first officially sanctioned World Tamale Eating Champion and his quest to defend his title. The film explores Levi’s hunger for fame and his desire to be successful in the quirky sub-culture of competitive eating. The film features top-ranked eaters like Tim 'Eater X' Janus, Crazy Legs Conti and Badlands Booker and others as they guide Levi's journey to find fame and fortune in their self-proclaimed sport. Will Levi defend his title?" The movie screens Tuesday, April 29, at 12:30pm at the Edwards Island theater. 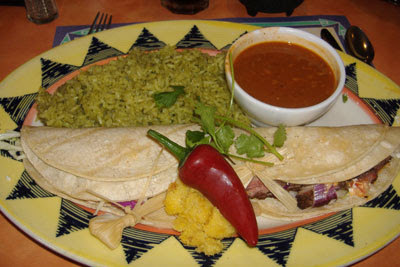 And blog favorite Taleo Mexican Grill is one of the festival's participating restaurants. (UPDATE: Cafe Maiz has closed.) Stopped earlier today for lunch at a soft opening of Cafe Maíz, the new fast casual concept from the El Cholo chain and met up there with Nancy Luna, the OC Register's Fast Food Maven (click here to read her report of the visit). They were getting ready for their grand opening to the public tomorrow. The interior was mostly finished and is very clean but also with a very traditional Mexican theme. Outside the construction workers were working on taking down the temporary banner and putting up the permanent sign. 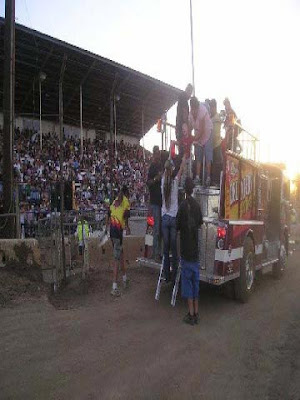 If you are on a mobile device or otherwise cannot see the photo slideshow above then CLICK HERE. Nancy placed her order first then me and we both found out later that we had each ordered an al pastor taco, made with slow-cooked, pulled, marinated pork. I believe this was the first al pastor taco I've had that was garnished with strips of pineapple. 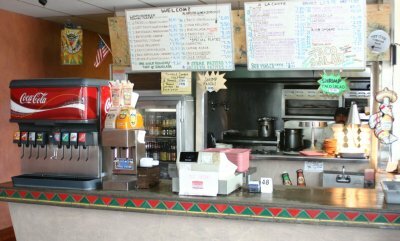 Generally, having al pastor tacos on the menu makes a Mexican restaurant's authenticity go up a notch. If you get them at Cafe Maíz try them with the Medium salsa. I also had very good carnitas taco that I gobbled down really quick but now that I think back on it I believe it had two kinds of pork in it. And that went good with the medium salsa too . . . and so did the nachos that Nancy and I shared. Actually the medium was the only kind I got but it was really, really good and I think it must've had some citrus kick to it. I even asked for the recipe on the way out but that remains El Cholo's secret. Nancy's blog had mentioned a guacamole kit for large parties to create their own customized bowl of guacamole with. 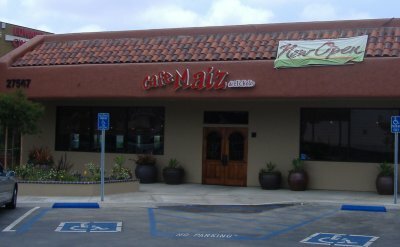 I found out today that that concept is being tested first at the Irvine El Cholo location and, if it's successful, it'll be added to Cafe Maíz. The El Cholo family of restaurants was one of the first places that helped Mexican food catch on in Los Angeles and Orange County back in the 1920's and when I was at their newest location today I saw many of the members of the family that have kept the tradition alive. The owner, Ron Salisbury, pointed out to me a picture of his parents on the wall who were the second generation of El Cholo managers. I've just been informed that each El Cholo location has a "Nacho Table." It's typically one of the "worst" tables in the house, and when people get seated there they get complimentary Carmen's Nachos to make up for the location. Now, the locations aren't terrible. You're not in the bathroom or getting hit in the back with the kitchen door, per se, but it's just a high traffic area outside the kitchen or something. Guests can actually ask for it if they know about it - there is often a wait for those tables even if other tables are available. So, if any readers sit at the Nacho Table leave a comment here and let us know. 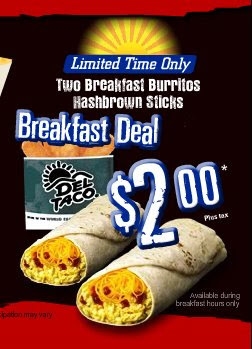 Just noticed that Del Taco has a new limited time only breakfast deal with two breakfast burritos and hash browns for $2. Also, since people have been searching a lot on "del taco breakfast hours" I'll just add that most Del Tacos serve their breakfast menu from 11pm until 11am. Selections included exotic tacos such as: Apple & Spice-braised Pork Belly w/ Pickled Red Cabbage, a Zucchini Blossom Relleno Taco stuffed with ricotta and Jack cheese served over oyster mushroom and red radish salsa, a Beef Tataki taco served in a sliced lobok root shell, an Oyster Taco served in its own shell with golden gazpacho, chile lime jelly, caviar and micro cilantro, and a S'mores Taco for dessert. I also had an interesting discussion with chef Stephane Beaucamp about why Kantina closed down. If you are viewing this page on a mobile device or otherwise can't see the photos above please CLICK HERE. In Mexico they have a treat called a "Raspado." When this was first described to me, I was told that it was like Mexican ice cream. I later came to find out that it is less like ice cream and more like a snow cone. The main difference between a Mexican raspado and a snow cone are the toppings. Snow Cones in the U.S. tradtionally come with super sweet, syrupy, artificially flavored liquid poured over the top of shaved ice. These are good....until you have a raspado. 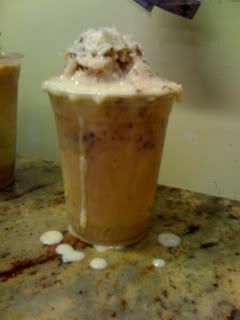 Raspado toppings are made with much better ingredients like fresh fruit and milk. The result is a decadent shaved ice that is just as cheap as the syrupy goop you grew up with. 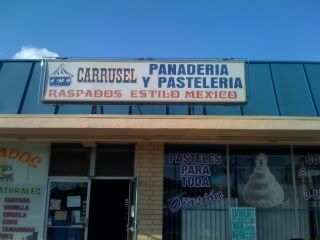 My favorite raspado combination is Vanilla, "Nuez" (Nuts, I think it's almond and pecan) and "Coco" (Coconut). A medium set me back $2.50. Other available flavors include strawberry, guava, peach, plum, bubble gum, tamarind, pineapple, mango and more. Its official site says that it's made for men but I can imagine two women sharing it, or one very hungry one because that's a lot of food. 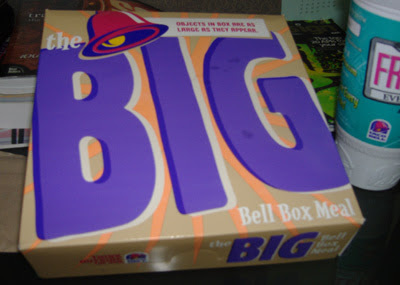 Many people are wondering how many calories are in the Big Bell Box Meal. By my calculations it adds up to 1180 calories without the soda. If you get a diet soda then no calories are added. Also, you don't have to eat everything in the box. When I tried it myself I only had about half of the cinnamon twists. People are always searching for information on how much the Big Bell Box Meal costs. I have seen it for $4.99. If anybody else has seen it for a different price please leave a comment and tell us what the different price is and where you saw it. 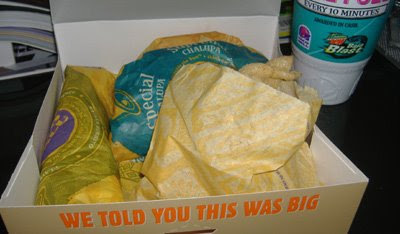 Also be aware that there are now more options for what you can get in your Big Bell Box Meal. The new Box meal appears to be centered around the new Chicken Flatbread Sandwich, with the sandwich, some kind of taco (Taco Supreme? 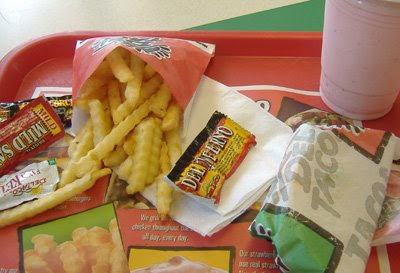 ), some kind of combo burrito, cinnamon twists and a soda for $5. IMPORTANT NOTE: Bobby D's is closed for remodeling until sometime in March 2010. When friends first recommended Bobby D's to me, I was a little suspect. The name had me thinking it was going to be a bland and safe "gringo" Mexican food place. Well, I'm happy to report that my first impression was wrong. Maybe that's why "Mexican food" is more prominently displayed than the name of the restaurant. That, and being hidden in the corner of the Target shopping center in Orange can make Bobby D's a little tough to find. But it hasn't prevented a lot of regulars from finding the place. A half dozen of us recently gathered for lunch mid-week, and there was a steady lunch crowd the whole time we were there. The two white board menus are jammed with combo plates, lunch specials, a la carte items, salads and soup. Combos run in the $7-8 range. For drinks you can get beer, sodas, horchata and orange drink. 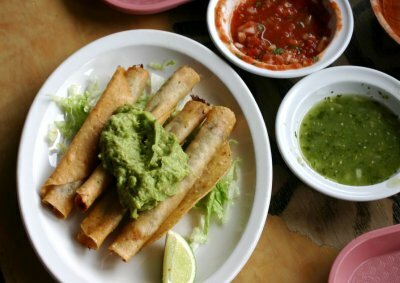 Kay and Cary shared an order of taquitos served with guacamole. Kay declared them the best taquitos she's ever had. She also enjoyed her a la carte chile relleno. 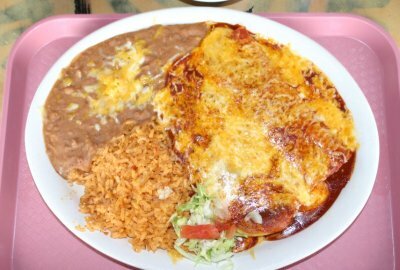 I went with the cheese enchilada and chile relleno combo plate. 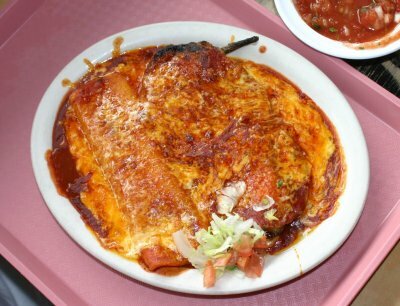 The relleno is a straightforward traditional style, so the chile is not the spicier poblano. Given that, it was flavorful and well made. I found the cheese enchilada to be just average. They strike me as something any competent home cook could make with off the shelf ingredients - not bad, but not memorable. What I'd like is a little deeper flavored red chile sauce. Dave ordered the two chicken enchilada combo plate, but I forgot to ask his opinion. But I'm guessing he liked it given that he cleaned his plate. 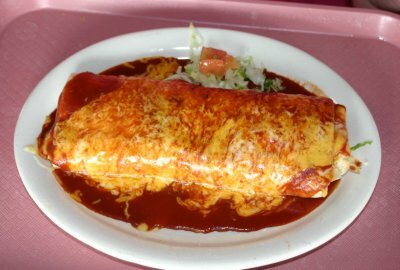 Linda, one of the people who turned me on to Bobby D's always gets the carnitas burrito served wet. Linda likes the carnitas at Bobby D's better than any other place because the meat is juicy, flavorful but has no fat or gristle. I've had this burrito too and must admit it is very flavorful for lean shredded pork. So if it bothers you to run into a hunk of fat or something too chewy in your burrito, you will probably like they way they prepare the meats here. To start with we all had chips and salsa. They have big crispy chips and a salsa bar with a number of options from mild to hot. The hot salsa also was loaded with lots of fresh garlic! 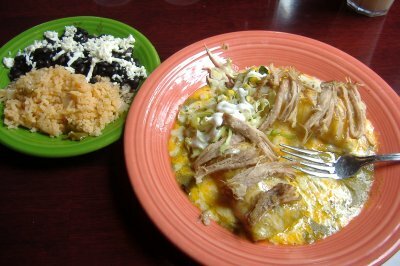 The food is pretty classic old school Mexican food, but it is served up fresh and tasty. I give it 3 and 3/4 Speedys. 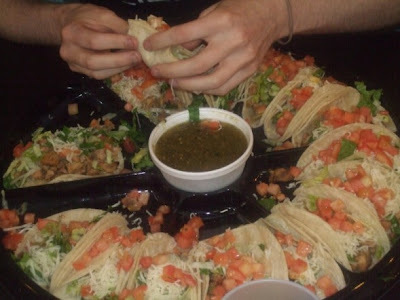 The Taco Eating Contest on Monday, April 7, 2008 at Tacos & Co. in Irvine was a huge success. There were 23 contestants, mostly from UCI and a few walk-in customers also ended up participating. The winner was Karina Muniz (a walk-in customer and the only woman who participated) who ate 8 California Tacos (chicken, lettuce, tomatoes and cheese on a corn on a soft corn tortilla) in 4 minutes. She won a $100 gift certificate. 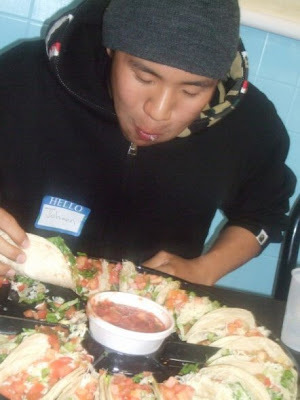 UCI student Jeff Fong came in second and won a $50 gift certificate after eating 7 tacos in 4 minutes and then winning a tiebreaker after eating 3½ tacos in 1 minute. 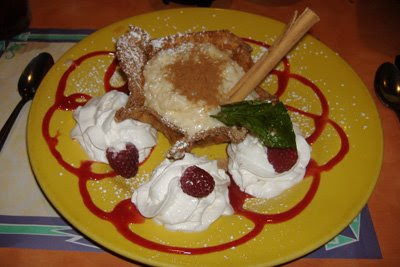 Specials this month at both Taco Rosa locations include a lentil soup, a calamari steak entree, a piña rellena (a hollowed out pineapple half filled with beef, chicken, and shrimp), and fruit chimichangas for dessert. If you can't see the photos above please CLICK HERE. Click HERE or on the 'taco rosa' label below for tons of information on both locations including dozens of photos, address and contact information, and links to their official site. Here's another entry where I cover some stuff that doesn't fit neatly into a standard restaurant review. 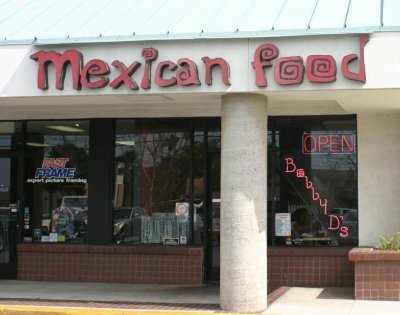 If this is your first time here don't let this entry throw you off; we really do have tons of reviews of Mexican restaurants, in fact almost 200, so just keep scrolling down. Mexican restaurants I've been to for non-review purposes since the last roundup entry include: Molcajete Grill, El Pollo Loco, Azteca's, Zorrito Mexican Grill, Taco Adobe, Taco Rosa, Tia Juana's, El Torito Grill, Chipotle, Wahoo's, Del Taco, Baja Fish Tacos, Cancun Fresh (which is now under new management), Tacos & Co., Blue Agave, Taleo, Las Barcas, and Mario's. Non-Mexican restaurants I've been to since the last roundup entry include but are not limited to: Ebisu, Cafe Chin Chin, Athens West, Genghis Khan Mongolian BBQ, Maki Yaki (they've got good California rolls), Tommy Pastrami, Dave & Buster's, River Belle Terrace, Maui Wowi, Red Robin, Claim Jumper, Newport Rib Company, and Cafe Hiro. There's a new Wild and Crazy Taco Night charity event put on by Share Our Selves coming up soon (April 17) that I should've mentioned earlier. This is where gourmet chefs from throughout the county cook up exotic tacos with all proceeds going to help the homeless. A VIP package is available for the first time this year. I've been twice before and there's always a lot of people there. "how many people like mexican food?" "amount of grease on fries"
"why are del tacos across the street from each other in lake forest?" "what did blacksmith's in the 1900's specialize in?" 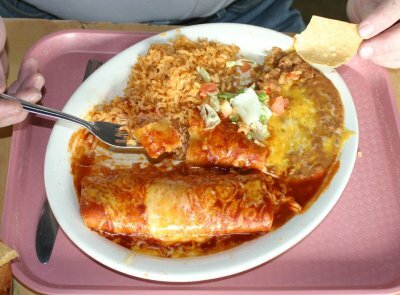 "mexican food and why they made it"
As I did last April I am going to attempt to take the month off from personally going to restaurants for review purposes. There will still be content coming, at least one new entry a week, but if you've been thinking about doing a guest review now is the time to get it written up and submitted and put yourself on the fast track to fame and fortune. During this month I am going to try to do a lot of work on the site, some that will be obvious and some that will be behind-the scenes. When I first started the site it was for my own personal musings on places I've eaten at, but now, more than two years later, it has become something like an official resource and that means having to handle everything more professionally. Last, but not least, please feel free to leave comments on any entry on the blog, no matter how old. When I go to a restaurant I can only report on my experience and on the food I ordered. When your comments are added to an entry here it increases the value of that entry for future readers.